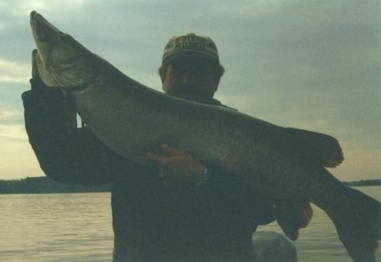 My good fishing buddy Tim with a 42 inch LOTW Fish. We caught 5 muskies that day! 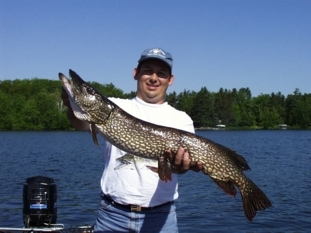 My brother Doug with his sweet 39 inch pike. This slob hit a suick in Vilas County Memorial Day Weekend! You just have to love those sunsets when your out musky fishing and you can't understand why no else is hitting prime time! My buddy Joe with his 47 1/2 inch pig! 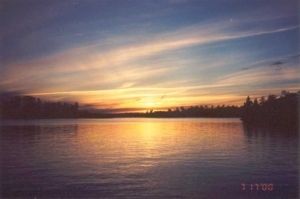 We boated her in the fall when we were forced to fish small Vilas County lakes because the wind was so bad. This beauty was caught on a quick strike rigged sucker and a bobber! As always she was released to bite again. 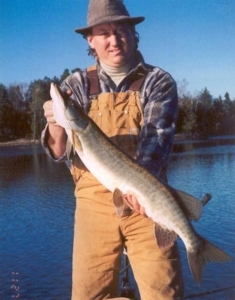 This Vilas County fish ate an Amma-Bamma the day after Thanksgiving in 1998! We couldn't resist taking advantage of the warm weather and open water. 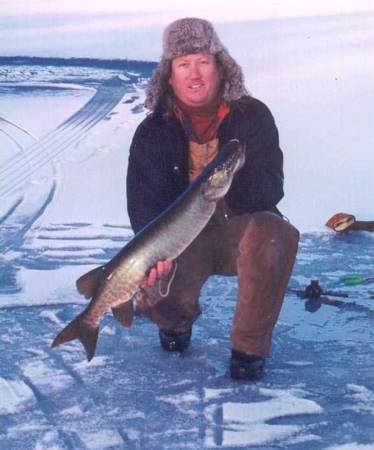 My first success at musky ice fishing! This Vilas County fish took a tip-up rigged with a quickstrike sucker. She was easily hand landed and released. Just like the preceding picture, she was caught the day after Thanksgiving but 2 years later! Notice the spot in the ice on the left and behind me, that was were I fell through the ice earlier that day! Good clothes really helps!!! 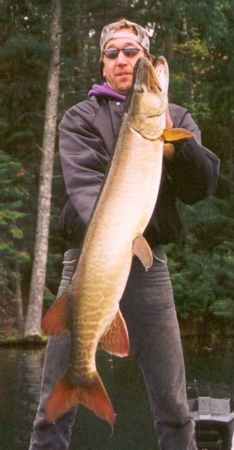 This fish was legally caught, as the Wisconsin musky season closes at the end of November. 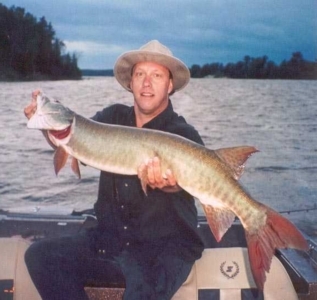 This is my good friend John Unsworth with a 50 pounder he took September 2000 on LOTW. He is owner of Sunset Cove Camp Sabaskong Bay, Lake Of The Woods, Canada. If you need a guide or a place to stay on Sabaskong Bay he is THE MAN!! !